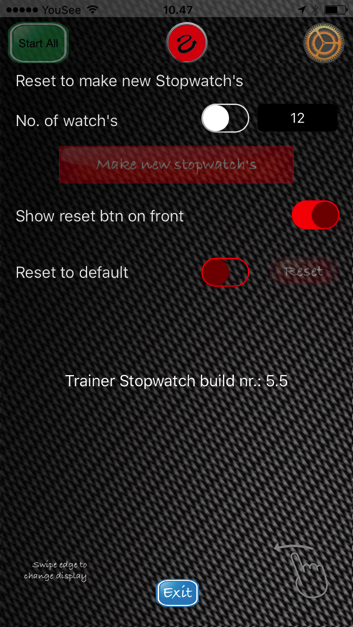 This is the Trainer/Coach Stopwatch, it can display up to 99 stopwatch's, it is up to you. All stop watch's can be started at the same time or individually. 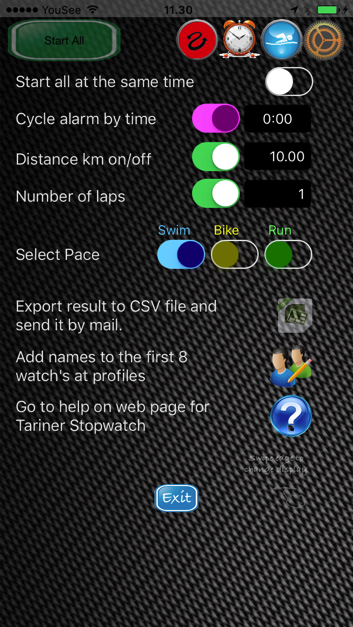 Tap on the lap button to stamp the lap time, at the end tap on the stop button for each stopwatch you have been using. Now you can choose to mail the result in a CSV file for later investigating in EXCEL or NUMBERS. Simply import it as text file and select options along with the import guid. If you enable distance to set the distance and numbers of laps it will inform you about pace along with the lap and end time. It can also give a tone signal as a cyclic alarm in order to help with cyclic training. 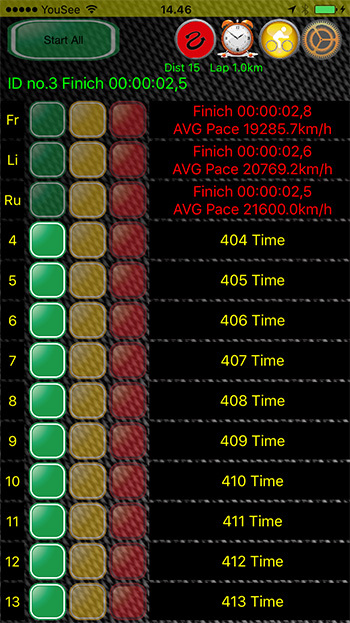 Profile can store 2 profile set-up with 8 names for the first 8 stop watch's. 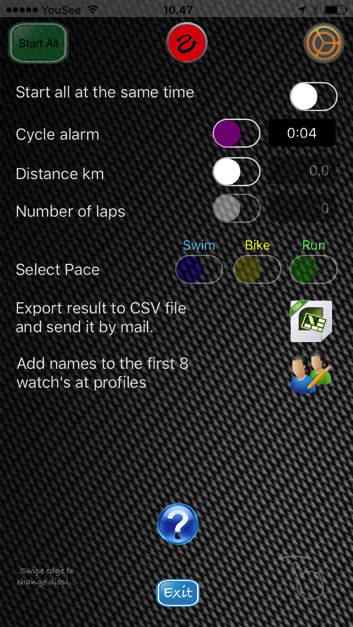 Profile is ment to set names on the first 8 ID's, up to 8 stop watch's. It will be displayed as the first 2 letters in stead od ID numbers. And will follow in the export CSV file as well. 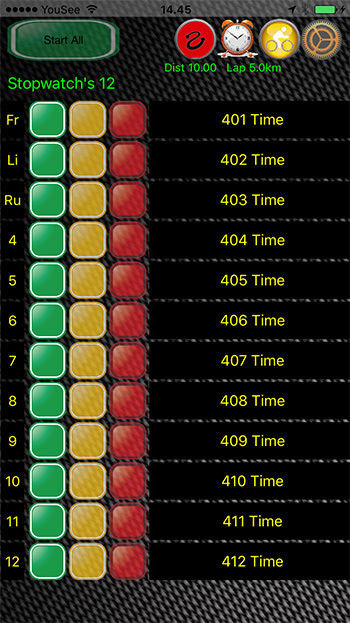 Find Trainer Stopwatch in App store. Enable start all at the same time. Cyclic alarm signal for cycle training. Set distance in KM for the hole training distance. Set number of laps if more then 1 lap. Select the PACE you want to have displayed at timestamp's (lap / stop). Export result, after stop of one timer you can choose to export result whenever you like. Profile button next to export button is to enter profile set-up. Show a reset button on the front top view, is to easily be able to reset ans start over again. Reset to defaults, is simply in order to reset alle settings. Question-mark is liked to the webpage. Use swipe to navigate right and left between setting displays. Enter up to 8 names for the first 8 timers. This is in order to put names on the first 8 timers, for easier recognise the belonging timer for the actual athlete. You kan store two sets og names. 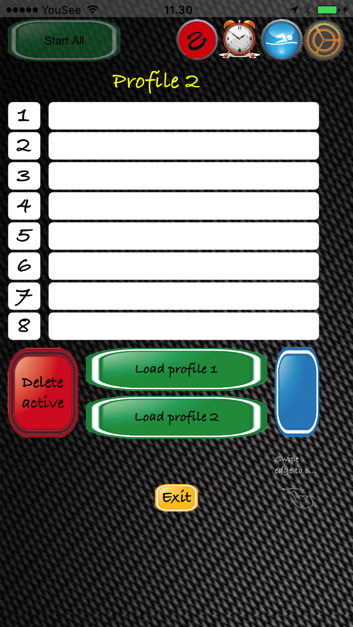 Here you can set the numbers of timers that you want to display on the front view. Or, reset to default settings. It will not delete the profile's you have saved. Only settings for the timers will be deleted. Profiles can only be deleted from profile settings view. 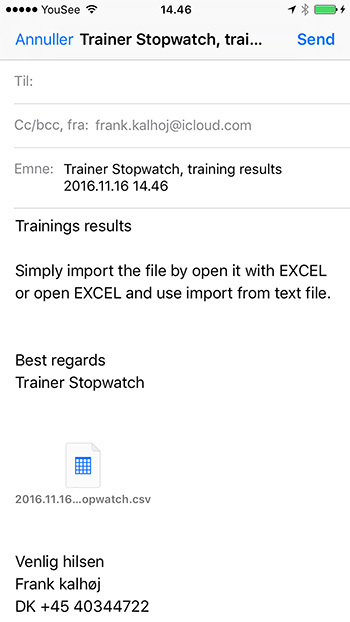 After training go to settings for sending the result as an export from this app. After training when the STOP button is pressed, only one STOP is needed. The export button is available. Tap the export button and a mail within the export file will show so you can mail it. Exit and reset to start an other training.